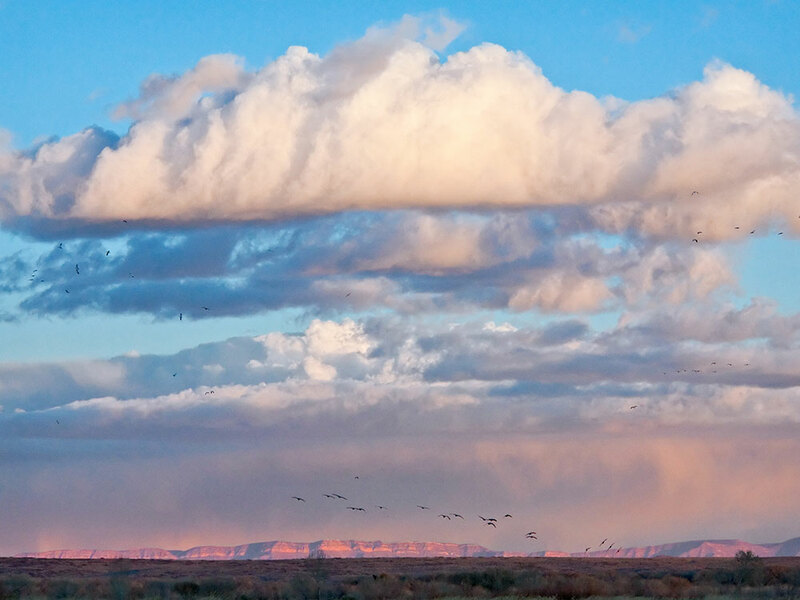 Bosque del Apache is over 55,000 acres of managed lands for the benefit of migratory birds. Through a network of dams and canals, fields are flooded providing a rest stop and food for tens of thousands of snow geese and sandhill cranes. Periodic trips to Alamogordo, New Mexico are required so we can visit our s-t-u-f-f tucked away in a dusty storage shed. Each time we swing open the door, we are a bit surprised at the items we have saved while unable to find some other needed treasures. 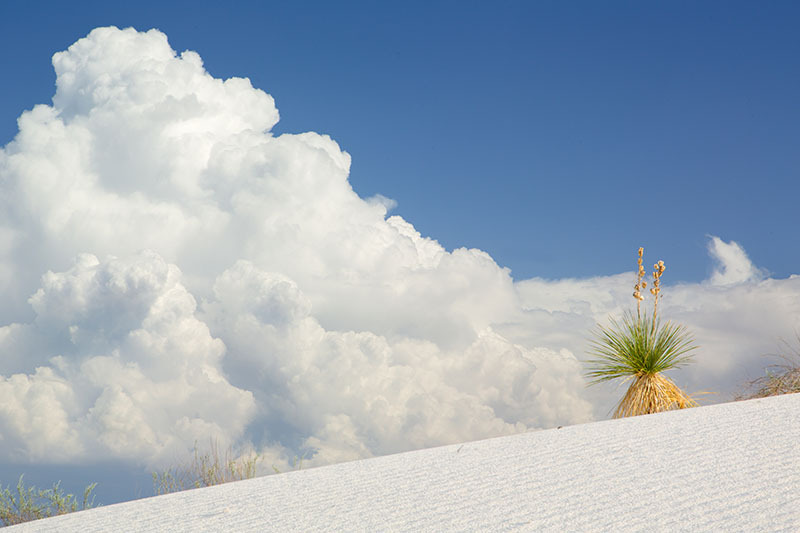 When visiting Alamogordo, we get our fill of Mexican food at Margo’s and visit White Sands National Monument. The Albuquerque International Balloon Festival attracts nearly one million visitors during the nine days of this annual event. My family would attend several days a year whenever possible, and we were especially interested in the special shape balloons. I have attended at least a dozen days of the early morning balloon lift-off events. Driving down the road south of Tucumcari, New Mexico I saw several cows on the porch of the house you see here in the background. Thinking cows on the porch of a house would make an interesting photo, I stopped. Cows never pay any attention to the many passing cars, which are the norm and happen all day long. However, if a car stops they immediately become interested in you and likely are hoping for some food. It was very evident the original photo vision was not going to work, so this photo is the result. It seemed to me that one cow was elected the spokesperson as all the others were too shy to come forward. This photo is so clear, the ear tags of the cows in the background can be read as well as seeing each hair in the cow’s snotty nose. However, I doubt this is going on anybody’s living room wall anytime soon…..Unless Kelly sees this and really likes it…..
Can anyone please remind me of the reason that the city of Santa Fe, New Mexico recently banned plastic trash bags? Ohhh, now I remember…. Ever have one of those days where you did not know if you should EAT or DRINK, then realized you could do both?? Eat or Drink, Which shall I do???? This is a very nice lady I met in a small town in southern New Mexico, Carrozza. If I get to visit just half the places she has, my retirement will be a success. She had such a great positive outlook on the world while doing it, something else I’ll work on…. 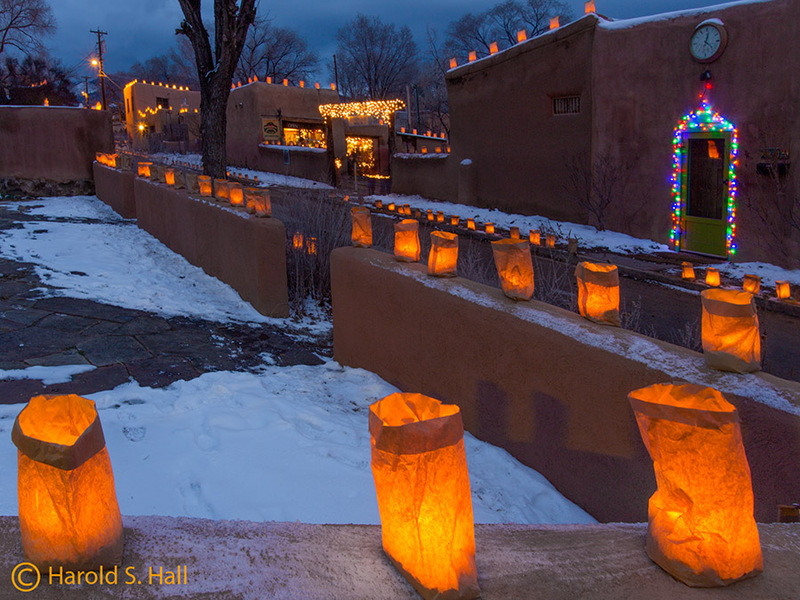 New Mexico has a tradition of lighting Farolitos and Luminarias during the holidays. Above are brown paper bags with a bit of sand and small candle placed inside for illumination. Small bonfires are also lit. 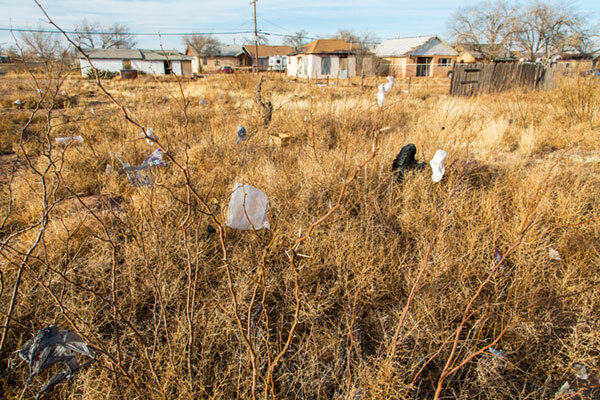 The other pastime in New Mexico, other than discussing which is better, red or green chile, is to argue if the bags are called luminarios and the small bonfires are called firelitos, or is it the other way around? I prefer to call the scene above bag-a-litos so there is no mistake about it…. I spent the month of December 2013 in Taos searching for a specific Christmas scene. An adobe wall and gate with a Christmas wreath, snow and some bag-a-litos. Not only did I not find such a gate, but there was hardly any snow in December. So the search goes on. Ledoux Street was made famous in part by the Navajo artist, R.C. Gorman. Although born and raised in New Mexico, I do not recall ever having traveled to Truth or Consequences, until today. The town is as funky as the name. The first store we wandered into was an East Indian meditation shop where customers were discussing shadowing techniques used in their tattoos. The town is full of laid back people chatting it up with surprised tourists. The town was originally called Hot Springs but re-named itself after the popular radio and TV show in some publicity contest in the 50’s. This town is near Elephant Butte, which is a large recreational lake that is in the process of drying up like the rest of the state. Instead of rushing north on I-25 as most do, we did our best to act like wondering retirees and took all of the side roads. Unique to New Mexico is the close relationship with red and green chile in our recipes. Most sought after is the Hatch chile from, of all places, Hatch, New Mexico. Hatch hosts an annual chile festival that I cannot necessarily recommend unless your relative happens to be competing to be the Chile Queen. I will certainly miss the great New Mexico chiles and the roasting tradition carried out every fall. Wonderful aromas and tastes. Everyone should have a freezer full. Las Cruces, New Mexico has had drenching monsoons like much of the rest of the state, resulting in carpets of beautiful yellow wild flowers. However, I was unable to find good back ground, light and clouds to go along with these, so this is the best of what I got. Thanks to Peg for putting up her newly homeless cousin for two nights.